Our “Girls Go Surfing” programme is set to start at the beginning of November where a trailblazing and intrepid group of 15 local girls and women who have shown a keenness to get in the water or who have come down to our Sunday evening splash abouts are ready to further their relationship with the ocean and all it has to offer. We are all very excited! In general girls and women in the Mentawai rarely venture more then waist deep into the ocean and never swim out of their depth. This is mostly just due to culture norms. In many parts of Indonesia having “brown or darker skin” for a woman is a no-no. But amongst the Mentawai women and girls that is not so much the case. They work outside a lot, harvesting coconuts, tending their local gardens, fishing and therefore have darker skin. Their innate affinity with and understanding of their natural environment is evident in the eyes of many of them when they see Karen, or I returning from a surf or swimming out in the bay. Wow! Women surf too! What is it like? Aren’t you afraid of the waves? Can I try? Is it difficult? What about the reef? What about wind? Do you get cold? are just some of the questions that we get asked at a hundred miles per hour illustrating their excitement at what they are seeing and contemplating. It is wonderful. Having taught the first girls how to surf down in Katiet, Southern Sipora where A Liquid Future used to be located, I realise that a role model is often all that these women or girls need. When there are surfboards around boys normally grab them and although some of the girls try to grab one to two, they usually come away empty handed. It is the domain of boys. That is a shame as the benefits to girls and women being able to swim and or surf are many, health, confidence, looking after the environment are just a few obvious ones. In the Mentawai the most common form of transport is a sampan – a small, narrow, wooden boat made from an entire tree with an outboard motor on it. Women with their babies and children travel on these to local markets to buy food or to visit relatives. I have sat next to countless mums with a look of terror in their eyes when the seas are rough and we are getting bounced around. They grab my arm, ask if we will be ok or if I am frightened or if I can help them if there is a problem. If I could not swim and had my baby in my arms I would be terrified too. Often teaching a woman to swim or surf and just have general awareness and confidence in the ocean means more likely than not her children will be taught by her too. 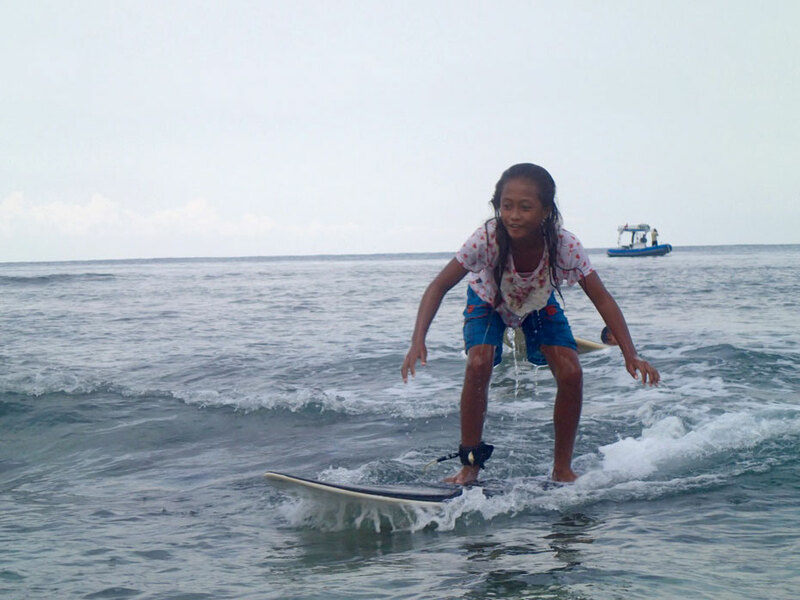 Mentawai women pass on and share their skills just as western women most often do. Teaching one woman to feel confident in the water has a ripple effect here. Here’s to making many ripples in ever increasing circles.